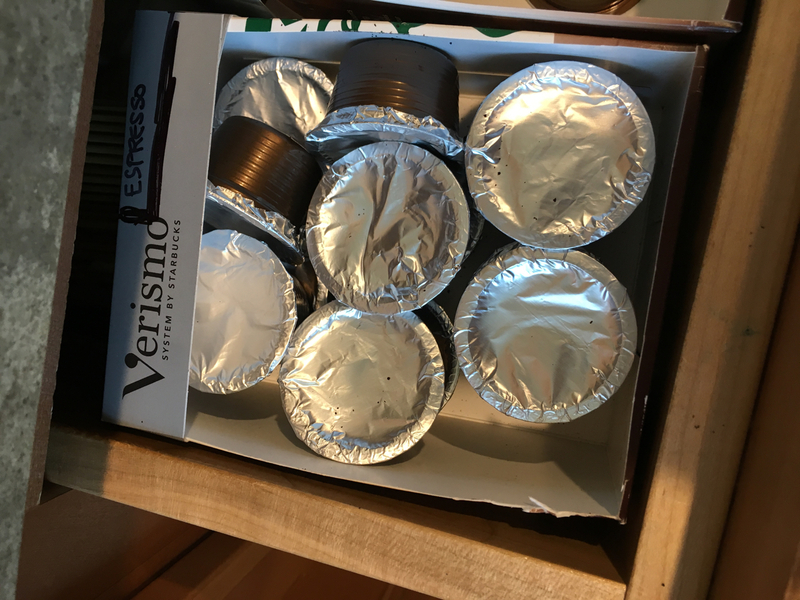 I recently received a Starbucks Verismo machine as a gift. It makes single servings of espresso and coffee and claims to make frothed milk to accompany said espresso. (I say “claim” because the result is probably the worst frothed milk–in terms of both texture and taste–that I have ever encountered.) When it comes to coffee, I’m still very much a French press kind of person. So for me, the Verismo is exclusively an espresso machine. Fortunately, it actually makes pretty good espresso. The problem is that it uses pods. I really, really, really hate the amount of waste that pods produce. I loathe Keurig machines for that reason, but at least sometimes there are options to use third-party refillable pods in those (at least until Keurig changes their DRM again to block them). 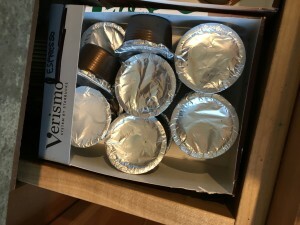 But the Verismo uses only disposable pods. No one has created a fillable one–so I decided to do it myself. You can do it, too. Here’s how. 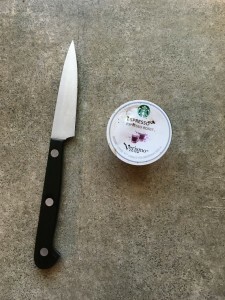 First, you need a sharp paring knife and some new Verismo pods that have been used once. 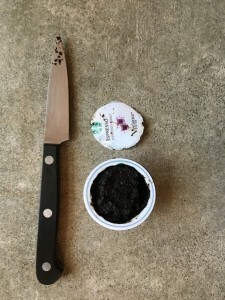 Remove and discard the foil “lid” of the pod. You want to cut as close as possible to the plastic rim of the pod. Dump the used grounds into your compost bin, wash out the pod, and set it aside to dry. 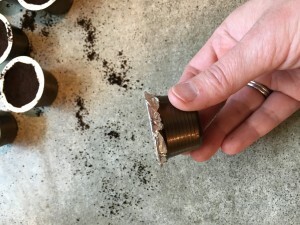 Use a 2.5″ hold punch (available from craft supply stores–I got mine at Michael’s) to cut circles of aluminum foil. The first time I tried this, I just cut foil squares with scissors. 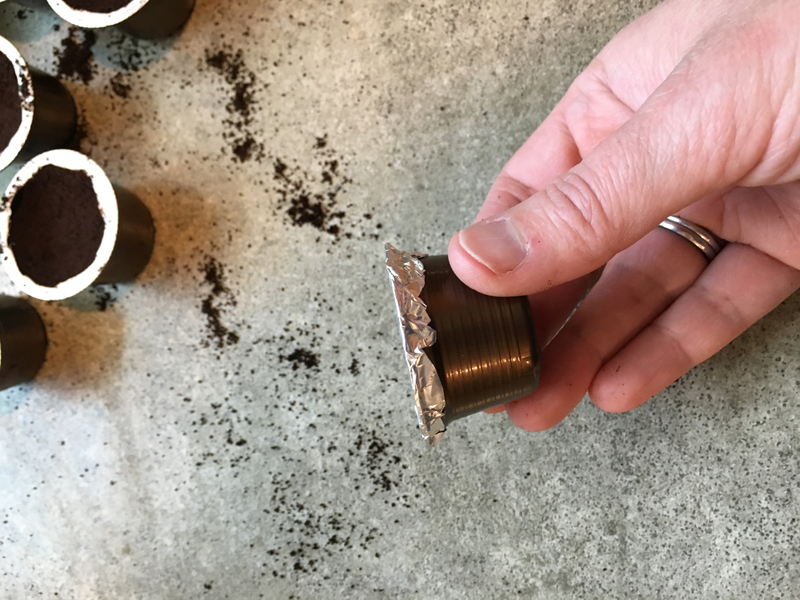 But using the punch is so much faster, and you end up with circles that are the perfect size for this use–not so large as to have a bunch of excess foil that could jam the pod in your machine, and not so small as to fail to cover the top of the pod completely and securely. Once the pods are dry, it’s time to (re)fill them! 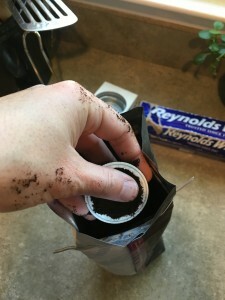 I’ve found that the most efficient method is to hold the pod in your fingertips, put your hand right into the bag of ground espresso, scoop the espresso into the pod, and use your thumb to tamp it down. Doing all of this right in the bag (rather than dumping the espresso into a bowl or other container) minimizes the mess. 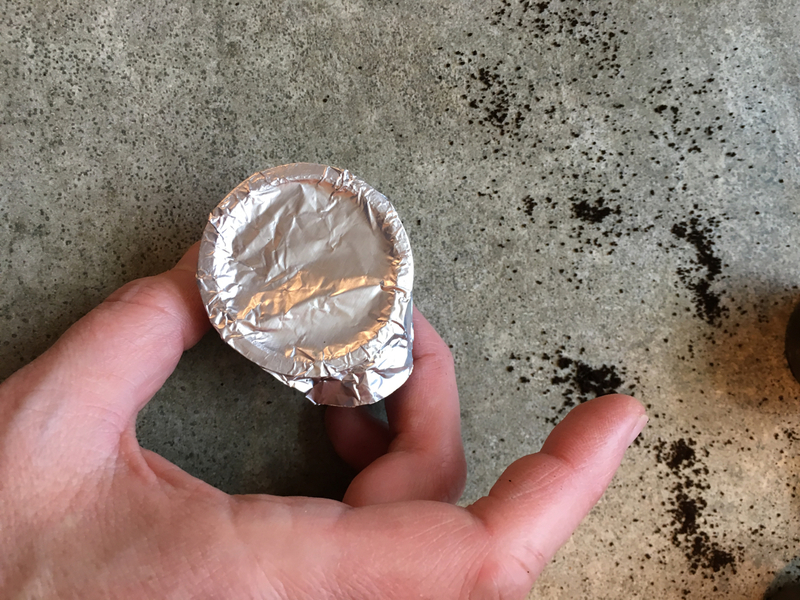 Center the foil circle on the top of your pod. Use two fingers (spread apart) of one hand to press down on the top of the rim (so the foil doesn’t shift) while you use the fingertips of your own hand to fold the foil under the edge of the rim. 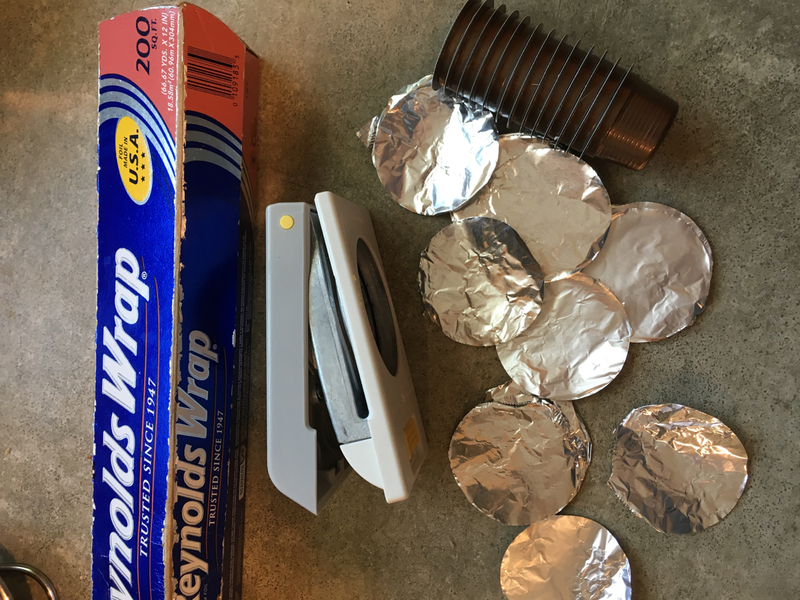 I keep my “crimping” hand at 3 o’clock and rotate the pod, not my hand, as I fold the foil. Here’s a side view of a (refilled) and (re)covered pod. And here are a bunch of pods, all ready to bring caffeinated goodness into the world! The pods come in boxes of 12. My machine came with one box, and I had to refill them every few days. So I bought another box to bring my pod total up to 24, and I’m finding that works great for my household. Our mainstay is French press coffee, and we use the Verismo machine when only one person wants a coffee drink. At this rate, we’re washing and refilling the pods about once a week. This is exactly why I haven’t purchased a pod machine. I love the coffee because it is quick, but the waste is awful. Sharing your post!